Unwaxed, fine-skinned Moroccan lemons preserved for deep citrus flavour. 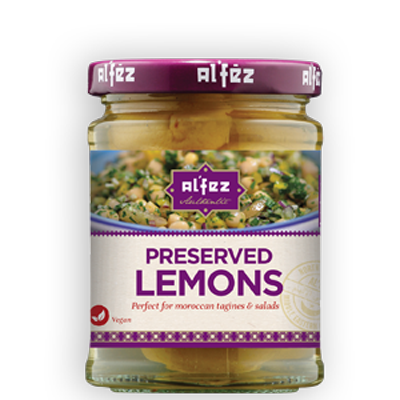 Our zesty Preserved Lemons are an integral ingredient in authentic North African and Middle Eastern recipes. Traditionally used to add an alluring depth of citrus notes to tagines, stews and sauces – this is now a versatile kitchen cupboard staple. Perfect for adding to tagines, stews or salads. Preserved Lemons provide more complex flavours than just squeezing a lemon over your food – they help to lift a dish by bringing out the surrounding flavours. Swap out fresh lemons for preserved ones for added ‘lemon umami’ intensity. Lemons, Water, Salt, Acidity Regulator: Citric Acid, Preservative: Sodium metabisulphite.